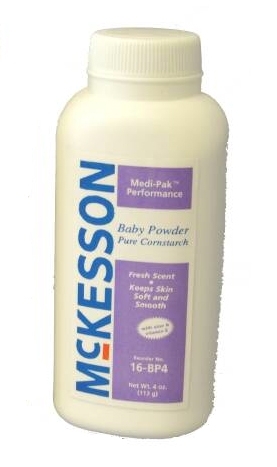 McKesson Medi-Pak Performance Baby Powder is pure cornstarch with Aloe and Vitamin E to help keep skin soft and smooth. It also has a nice fresh scent. It is packaged in a convenient shaker bottle to allow easy application of powder. Cornstarch based baby powder is perfect to use to absorb excess wetness from sensitive skin. It also helps keep skin dry while providing a soft texture to help fight uncomfortable friction. It is useful for preventing diaper rash, as a deodorant, or protecting skin prone to friction.